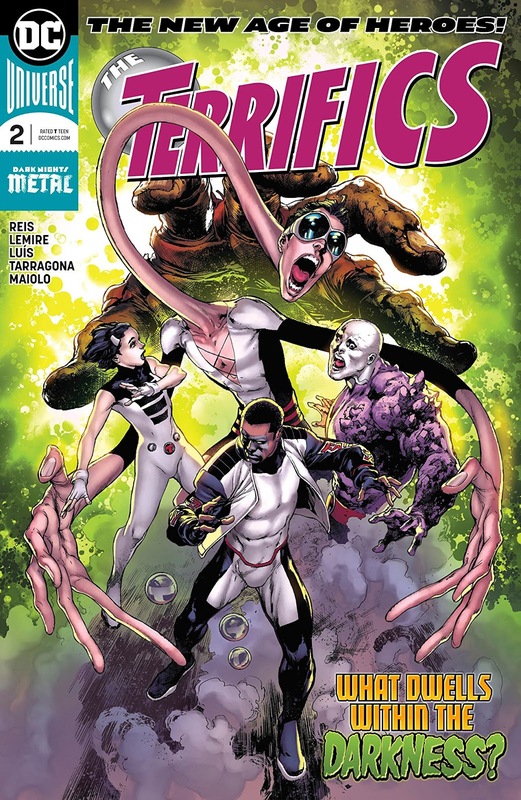 DC has been touting its "New Age of Heroes," but the only one that's drawn my attention so far is The Terrifics, a team loaded with four favorites. The team includes the genius Mr. Terrific, the malleable Metamorpho, the even more malleable Plastic Man, and the intangible Phantom Girl. So the irony is that no hero is particularly "new" - two originated in the '40s and the other two in the '60s - but they are all severely neglected and certainly deserve time in the spotlight! They're thrown together during a trip to a dark universe, where they find the modern-day Phantom Girl and face a titanic threat. And there are more surprises waiting for them on their home turf! With outstanding art by Ivan Reis, Jose Luis, Vicente Cifuentes and Jorda Tarragona, and a fast-paced and clever story by Reis and Jeff Lemire, I can only hope that this "New" team sticks around for a good, long run of stories!